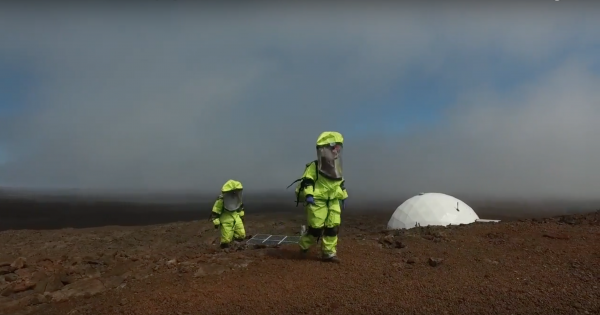 Eight months ago, NASA OK’d six individuals to serve as psychology research subjects for Mission V, which took place at a facility at the University of Hawaii, Hawaii Space Exploration Analog and Simulation (HI-SEAS) at the Mauna Loa volcano. The crew stayed the course and, eight long months later, are set to emerge from their habitat today (September 17, 2017). The team has successfully completed the mission and contributed, through their months of unique living circumstances, to our understanding of the psychological effects that long-term space missions might have on astronauts. The island, Big Island, on which the simulation is taking place is relatively remote and secluded. But to truly create the experience of isolation — which could be comparable to an astronauts’ aboard a long journey or on a Martian base — the simulation was complete with a 20-minute communication delay with the outside world; approximately the amount of delay between Mars and Earth. At the center of the experiment was a 1,200 square-foot (111-square meter) dome in which the subjects lived. With that in mind, perhaps NASA may learn (after analyzing eight months of data) that the essential element for keeping tensions at bay and the ill-effects of isolation quelled is simple: better food. But whatever is found as a result of this long experiment, it is certain that such studies are not only important but essential inensuring the safety and mental well-being of future astronauts (and future research subjects).